The complexity and unpredictability of the human body and the human spirit is one of the great mysteries of life. Why is it, for example that some people smoke their entire lives and remain healthy, while others who have never touched a cigarette die from lung cancer? Some members of a family have terrible eyesight, while others see perfectly well. Some are good at math; others become artists or writers. And some pitchers with inefficient deliveries don’t get hurt and some with far more efficient movement patterns can’t seem to stay healthy. My treatment/training philosophy as a physical therapist and baseball coach has been influenced by many great mentors and colleagues: Ron and Jill Wolforth, Flint Wallace, Oliver Kadey, and Jonathan Massey of the Texas Baseball Ranch, legendary PT Phil Donley, Dr. Ed Fehringer, Dr. Koko Eaton, Mental Game Master Dr. Tom Hanson, Matt Furey, University of Arkansas pitching coach Wes Johnson, Dusty Blake of Pfeiffer University and Pitching 360, South Alabama Pitching Coach Bob Keller, Super Agent Mike Milchin, Jim Wagner, Fred Corral, Derek Johnson (Milwaukee Brewers), Andy McKay (Seattle Mariners), Lee Fiocchi (L.A. Angels), Brent Strom (Houston Astros), Mike Ryan, Dewey Robinson/Kyle Schneider (Tampa Bay Rays), Tommy Phelps (NY Yankees), Drew French/Chris Holt (Houston Astros), Eric Bender (Cleveland Indians),Steve Morgan, Dr. Frans Bosch, Martin Bosey, Alan Jaeger, Eric Cressey, Gray Cook, Greg Rose, Mike Bard, Chas Pippitt, Mike Posey, Adam Farout, Bret and Kyle Wagner, Blane Fox, Chaeli Greco, Bob Greco, my longtime business partner Amy Marsh, and countless others in the PT and baseball industries. All of these wonderful people have shaped my understanding and application of the principles we use every day to help our athletes improve their ability, or overcome their arm pain. I truly stand on the shoulders of giants. As technology improves it often become clear that this humble consortium of forward thinkers were doing things that turned out to be right even before we knew why they worked. The science has frequently validated our methods. As I consider the explanation for this recurring phenomenon, I have to believe it stems from two factors…1) our unwavering willingness to allow the student to teach us WHAT and HOW he needs to learn, and 2) the collective acceptance that we will never fully understand the complexity and unpredictability of the training athlete’s body. Others in the industry don’t seem to share this understanding. For example, when someone says something like, “When a pitcher does A, B, or C he always gets hurt.” Or when they say, “If X happens then you AUTOMATICALLY need to get a MRI ASAP,” they disobey a truth that our group has come to understand… While universal, simplistic, clever sounding responses to issues with individual pitchers may make us feel better. They often represent a less than effective way of addressing the issue. And when it comes to individual career/life altering decisions like when to get a MRI or whether an athlete should undergo surgery, the answers ALWAYS will be…it just depends. It’s common in the western medical world, when dealing with an issue like arm pain, to look for a definitive “diagnosis” that gives the “cause” and subsequently, a “cure” for their problem. Many injured players and their families have the misperception that a MRI will be the solution they’re looking for – like the MRI is the magic 8-ball wizard that will hold all the answers to their questions. Frequently, players, instructors, and medical providers rush to the MRI only to find evidence that is irrelevant or inconsequential to the patient/player’s ultimate treatment plan. That paradigm shifted for us when we stooped looking for “diagnosis and cause” and instead started looking for “dysfunction and contributors.” It’s never one thing that “causes” an injury, but rather a confluence of contributing variables that merge in the perfect storm to create an environment where injury can occur. Injuries to throwing athletes are always multifactorial and even if a radiologist says you have a UCL tear, you can’t be sure of the severity of the injury or the prognosis for recovery. It’s a well-known issue in the medical community that inter- and intra-rater reliability on Magnetic Resonance Imaging can be a problem. Two separate radiologists might read the same MRI and come to different conclusions. Additionally, an MRI read by the same radiologist at different times can result in disparate findings. Moreover, MRIs of asymptomatic pitchers often reveal incidental “damage” that has no effect on the athlete’s pain or performance. I am not at all intending to be critical of the highly qualified medical professionals who read and report on MRIs for a living. Every radiologist I have ever met has been incredibly intelligent and exceptionally skilled. I am just stating the facts and trying to point out that while MRI is a fantastic tool, it is not a panacea that provides a slam-dunk solution to a throwing athlete’s arm pain. One of the cornerstones of our approach to managing arm pain was described in our recent book and video called Start With The Pain: The Complete Guide To Managing Arm Pain In The Elite Throwing Athlete. If it hurts your elbow to throw a baseball, but you can throw ANY other object (a plyo ball, a football, a bell club, etc…) without pain, we’ve got a chance to help you back to high-level performance. Moreover, the decision as to whether to get a MRI, or even to have surgery depends on a lot more than simply the presence of pain with throwing. In May of 2016, I got a desperate call from the father of a high level College pitcher. I’ll call him Will. That’s not his real name and I won’t reveal his university. Will’s dad shared that his son had just completed a fantastically productive season as the Friday night starter for a pretty good D1 program. After the season Will was slated for a spot in the prestigious Cape Cod Summer League. But, in his last start of the conference tournament, Will had experienced significant elbow pain and a loss of velocity. He had a MRI had that revealed a partial tear of his UCL. Doctors recommended an immediate UCL reconstruction, a procedure that would end any hopes of playing in the Cape and would probably preclude him from playing in his next collegiate season. Will and his dad were lost about what the best path to recovery and return to play might be, so they turned to me for some advice. In the athletes I’ve seen, and according to most researchers, complete ruptures of the UCL require surgery (although we have had one pitcher who came to us with a complete rupture and opted to forego the surgery that was able to get to 92mph without pain). But, according to a recent study in the American Journal of Sports Medicine, 93% of partial UCL tears return to their prior level of competition with traditional physical therapy and no surgery. And, that was with only traditional therapy – not the innovative and highly effective process we use here at FBR. Even if Will had opted for surgery immediately, the typical UCL rehab time from surgery to game competition without limitation is 12-15 months. That would mean, at best he wouldn’t be ready for action again until May of 2017 – too late to participate in the next spring collegiate season (I have seen one case where the pitcher started throwing in games at 9 months after a UCL reconstruction and he did extremely well, but that is generally the exception, not the rule). On the other hand, if Will decided to wait and give our stuff a try and we weren’t able to pull him out of the fire… if our attempts failed, and he had to undergo surgery, he could afford to wait until as late as November of 2016, and he would still make it back for the 2018 season. The delay would have cost him no additional loss of significant game readiness. That would give us almost 6 months to try and figure it out. When an elite level or professional thrower is deciding whether or not to undergo a surgical repair, the timing of the injury/surgery is important. You have to know the time it will usually take to get back to full intensity competition and you have to know when your next competitive season starts. For example, a college or high school pitcher usually starts his season in mid-February and conference play usually doesn’t start until mid-March. If a player at one of those levels is injured in February or March, he might consider having the MRI and/or surgery ASAP so he would be ready for his next season. If injured after March, he has at least until November before he needs to make his decision. A pro-guy having surgery in April would likely be ready to go by July of the following season, so the month of May becomes a significant “cut line” for him. If he’s injured after May, a professional player can afford to wait until October or November to make a decision on the surgical option. That gives us until around November 1st to work the magic and bring him back. Will decided to push the decision on surgery back and give the FBR process a go. He entered out Summer Training Program and worked his tail off. 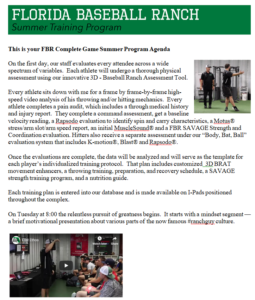 We began with a full head-to-toe physical assessment and a video analysis of his throwing motion. We then designed a comprehensive training plan that included corrective throwing drills to improve his mechanics, a mobility plan to eliminate his physical constraints, a customized strengthening program, and a nutrition plan. During his evaluation, we noted that all baseball throws elicited pain, but when he threw a 7oz ball in the Durathro® Training Sock and when he threw a football, he had no pain. His throwing training plan was designed around these observations. He performed his assigned corrective drills, initially using only a 7 oz ball in the sock and a football. Over the course of the next 4 weeks, we gradually weaned him off sock throws and football throws adding progressively more baseball throws while simultaneously ramping up his intent and volume. By late July, Will was pain free and touching 90 mph in his training sessions. At that point he decided to go to the Cape for the rest of the summer. He lit it up, fuzzing 93-94 mph and posting a sub-2 ERA. When he returned to school in the fall he was healthy, stronger, pain free and throwing harder than ever. He had another incredible year and was selected in the MLB draft. According to Will, he hasn’t had any elbow pain since the initial evaluation at The Ranch. Call us at 866-STRIKE3 (866-787-4533) and let us help you decide the best course of action. No matter what diagnosis or prognosis you’ve been given, I’m certain we have a high likelihood of getting you back to competition without having to miss up to 18 months of action.